Late the other night I was digitising a number of 78 rpm records from the Johannesburg-based Bantu Batho or BB label and came across six curious, up-tempo band recordings that had been ascribed to Nyanja. Nyanja or Chewa is the national language of Malawi but is also spoken in Eastern Zambia, Northern Mozambique and parts of Zimbabwe. Many South African recording companies with trans-African commercial aspirations (not that dissimilar from their European counterparts such as Columbia and Gramophone Company), employed scouts or experts—Hugh Tracey at Gallo for example—to travel north beyond the borders and acquire indigenous recordings that would then be marketed back to consumers in those countries of origin. Though I would be curious to examine the ratio of discs made for the export market versus those retained for local consumption in South Africa. 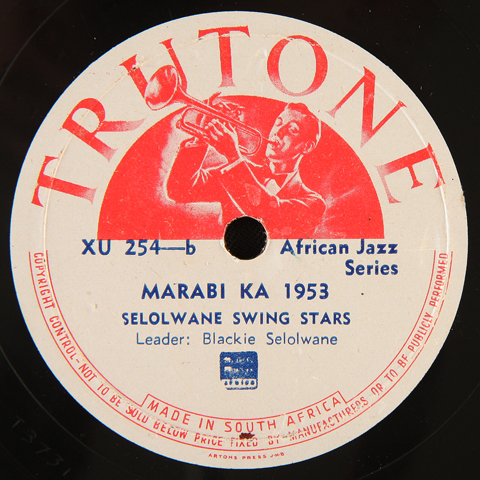 Were these recordings from many countries in Africa, marketed and distributed ‘evenly’ across Africa or was each market established primarily to connect local artists with local consumers? 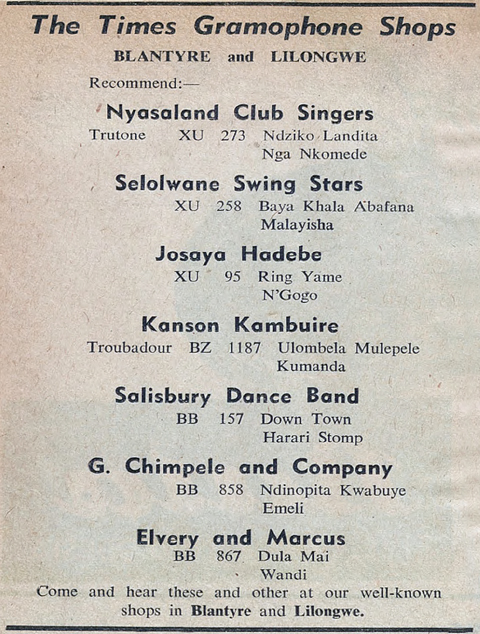 This 1954 advertisement in the newspaper Bwalo La Nyasaland, published in Southern Rhodesia (now Zimbabwe), showcases records produced by three South African companies—Trutone, Troubadour and Record Industries—with artists from Nyasaland (Malawi), Southern Rhodesia (Zimbabwe) and Bechuanaland (Botswana), available from shops in Blantyre and Lilongwe, Nyasaland. One often reads about the stylistic influence of Ndebele guitarists, such as Josaya Hadebe and George Sibanda, on any number of Zulu maskanda artists through the distribution of their recordings rather than access to live performances. Certainly it would be interesting to explore the role commercial companies played in the spread of musical influences across regions of Africa. In another thought, I also wonder what or who Josaya Hadebe may have been listening to? Returning to the recordings at hand. 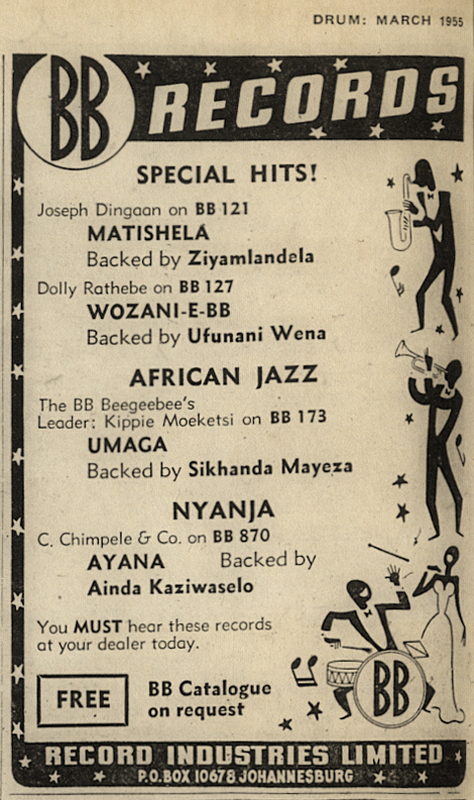 The BB label owned by Record Industries Limited (RI) in Johannesburg employed a catalogue system to categorise the music thematically by language or style. So for example the BB 100 series was dedicated to popular tunes or "Special Hits! "; African jazz was represented in the BB 150 block; the BB 400 series for recordings in Sotho; BB 450 for Venda; BB 500 for Zulu; BB 600 for jive; BB 750 for Shangaan and so on. (Many thanks to Rob Allingham for these details.) Without too many discs to refer to, It is my guess that the BB 850 block was dedicated to recordings from Nyasaland (Malawi) and possibly Tanganyika (Tanzania). Perhaps ironically, this indexing of languages to a numbering system is not that far off from a more complex approach employed by ethnomusicologist, Hugh Tracey. His system is (partly) depicted in the map above used as the cover for this selection of music. Black borders containing names of countries are superimposed with red borders surrounding numbers denoting language groups. Incidentally, Tracey’s number for South Eastern Africa is 52 and within that, Nyanja would be classified as 52/3/1. This is pure speculation, but it is probable that Tracey may have made the first recordings of G. Chimpele, one of the artists featured in this selection. 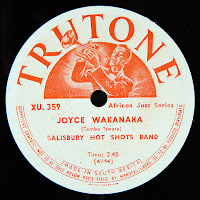 Meta-data for the track Mwanakadzi in the ILAM Digital Archive dates that recording to February 21, 1952 with a matrix number of XYZ 7198 and issued on the Trek label as DC 238. 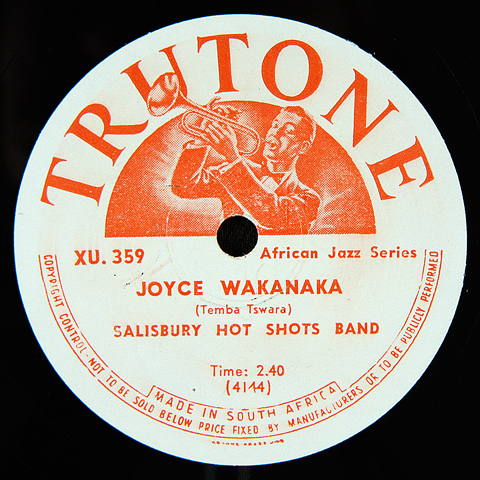 The XYZ prefix was assigned to acetates cut from Tracey’s field recordings made across Sub-Saharan Africa. (Allingham) Tracey’s meta-data in the ILAM Archive also suggests that the Trek recording was made in Zomba, a city in Southern Nyasaland. Zomba was the capital of Nyasaland, and then Malawi, until 1974 before it was superseded by Lilongwe. G. Chimpele and Company is represented by four tracks on this compilation, all from the BB label, recorded sometime in 1953. My further speculation is that the Trek recordings proved popular enough for a competing record company—Record Industries—to send out a recording unit to Nyasaland the following year… but it is more likely that they brought the musicians down to recording studios in Salisbury, Rhodesia or Johannesburg. 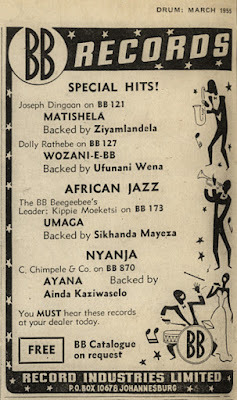 Rob Allingham ruminates in a note on another group featured in this selection—the Ziphondo Band—that he could not recall if the tracks featured on BB 860 were recorded in Rhodesia or Johannesburg. (Allingham). Unlike the standard BB matrices that include an N prefix, some of the Nyanja recordings have an additional matrix number with the prefix MTS in front of the N number (for example MTS 53A/N 1682). G. Chimpele employs what sounds like an accordion, which for me, gives this music a distinctly Creole flavor. While Elias Ziphondo includes at least two guitars, one strummed at great speed to almost sound like a banjo. 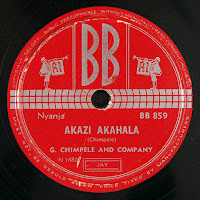 Notably on his track Cheleka he introduces a whistle reminiscent of those used by mine dance groups in South Africa. All tracks are backed by an infectious up-tempo drum rhythm making them more than suitable for dancing. 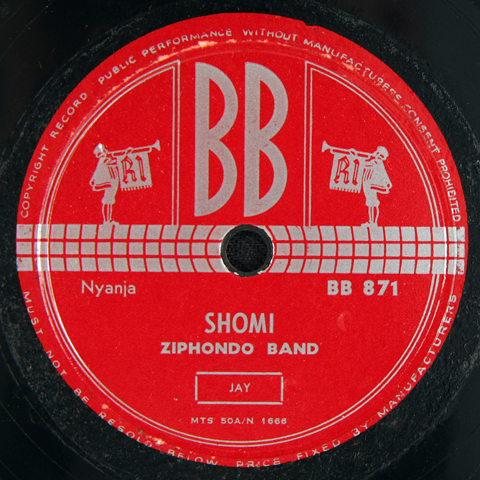 Ziphondo’s Shomi is a grammatical contraction of “Show me the Way” which, I assume, could be derived from a Western popular and/or religious tune. It is also the inspiration for the title of this compilation: Shomi the Way! Blackie Selolwane, a notable composer and saxophone player originally from Francistown, in Eastern Bechuanaland (Botswana) near the border with Rhodesia (Zimbabwe), introduces the second part of this compilation which drifts towards a distinctly majuba or African jazz sound. The region around Francistown became the site of “Africa’s first gold rush” when the precious metal was discovered there in 1869. Subsequently, the town was also included in Cecil John Rhodes’ epic plan to build a railway from Cape Town to Cairo. During the great depression of the 1930s, the mining industry went into decline but the economy of the town was sustained as it became a transportation hub for companies that recruited workers from a number of African countries to work on the South African mines. Through mining interests and subsequent cross-border trade with Zimbabwe, Francistown grew into Botswana’s second largest city. Incidentally, Francistown was the location of Botwana’s first tarred road, a curious but significant anecdote, given that Blackie Selowane was a driver for Bailey’s Transportation. 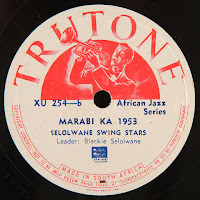 Having said that, Todd Matshikiza in his August 1953 Drum review of the Trutone XU 254 disc does say that the Selolwane Swing Stars were from Bulawayo in Rhodesia, so it is more than likely that Selolwane moved around. This is confirmed when Matshikiza adds that the group actually travelled to Johannesburg to record Marabi Ka 1953 and Baba Mkulu. Unfortunately their pianist did not make it and Sol Klaaste stepped in. An aside, Selolwane, is the father of renowned guitarist John Selolwane who performs with Paul Simon on the classic Graceland. As I was preparing this compilation, I initially focussed on the six BB tracks, their country of origin and why a South African company had chosen to market them. As research drifted from languages to borders, geography and styles, other tracks seemed relevant to the discussion and the selection grew. The music on the first half of this compilation retains a kind of raw, 'indigenous' quality. While the majuba tracks on the second half represent a shift towards urbanisation through the language of American swing and its transformation into African jazz. For me, however, these tracks still retain a raw, perhaps local, 'indigenous' flavor reminiscent of the marabi sounds of the 1930s or tsaba-tsaba of the 1940s. 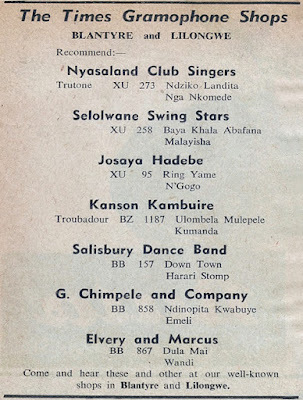 The thumping rhythm section of Temba Tswara's Salisbury Hot Shots Band is a great example or simply the title Marabi Ka 1953 by the Selolwane Swing Stars says it all. By 1953 the majuba or African jazz sound was peaking in South Africa with groups like the African Quavers from East London. 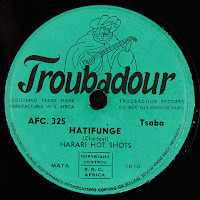 As I listen to the last six tracks here, recorded between 1953 and 1956, and compiled chronologically, I can hear a shift towards that jazz refinement, most notable in the final tracks by the Harari Hot Shots. It makes me wonder what records these guys were listening to? Where did they buy their records? And in turn, who was listening to their discs? How did styles travel? What role did commerce, mining, transportation and urbanisation play in the spread of this sound? 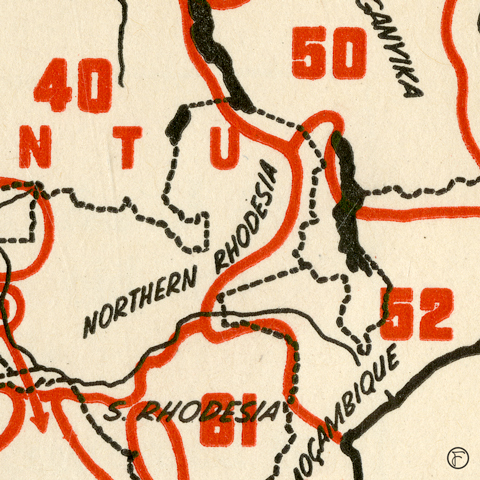 Incidentally Salisbury, the capital of Rhodesia, was renamed Harari, after its largest Township, in 1982. I wonder if the Salisbury Hot Shots have any relation to the Harari Hot Shots… and if so, whether this name change was a prefiguration of the coming post-colonial shift. In closing, these anecdotes around geography and economics lead me to rethink the function of the discs. In as much as South African recording companies were exporting records to foreign markets, South African mining companies were importing labor from many of these same countries. It could be argued that another possible function of the music produced by these companies was to target home-sick foreign laborers, turning them into ‘domestic’ consumers by providing them with a taste of home in a distant land. Once again an outstanding story about indigenous music by Prof. Siemon Allen.! Many thanks, Olivier! Hope you are keeping safe back home!!!!! Thanks Siemon! Yes, I'm safe but some of my collegues were affacted by those attacks. Very sad... But, hope for a better world will always guide my behaviour!!! Stupendous stuff, as usual. Huge thanks! Thanks, Doug. Hope all is well with you! This is splendid. Thanks for sharing. To Matt, Siemon, Nick & Chris. Happy New Year and thanks for all the music. It is a pleasure to listen to. I look forward to many more postings, especially the older instrumentals. Many thanks, Andrew! Sure thing! Thank you for enriching the world with the amazing music that you uncover. I would love to listen to this but can't find a link.